Your kid’s bedroom should be a place of wonder and creativity. Whether they’re into the latest superhero, enjoy the great outdoors or have a favourite TV show, it’s likely their room will reflect this. There are many alternative options to your bog standard kids' bedroom lamp that will transform their bedroom into another dimension of adventure, learning and imagination and we’ve lined up our top picks of the best kids' lamps right here. If your children are fear the dark, there are plenty of cool and quirky children's night-lights that aren’t too bright and set a nice soothing atmosphere when getting little ones ready for bed. If you want a lamp that is good for playtime, then there are some fun and interactive lights and even lights that double up as building blocks, that will encourage creativity and create an exciting bedtime environment (and might even encourage them to head to bed!). You’ll also want to consider space. 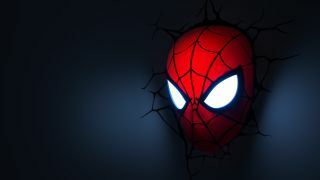 If your child's bedroom is on the smaller side, then lamps that can be wall mounted are a good option: Marvel character wall lights that appear to 'burst' through the wall are all the rage right now. But if over the top character lighting isn't your idea of interior design perfection, classic bedside lamps are equally ideal for children's bedrooms, plus this type of lamp is far more ideal for reading and having easy access to switch it on and off when you need to. So let us help you find a lamp that your kid will love, and one that won’t cost the world. We also recommend checking whether a lamp runs on batteries or through the mains, as a portable lamp can be handy when the kids have sleepovers in the garden, head off camping or if you want to have a comfort nightlight that can be taken on holidays. Bedroom lamps have never been more exciting than this 3D Light FX Spiderman lamp. This is a 3D style lamp that is wall-mounted which is great if you don’t have space on the bedside. There are a range of Marvel, Star Wars and other popular characters that add an element of interactivity to the room. We think that these lamps are great for kids and adults alike, and are a fantastic novelty piece for offices, bedrooms and man caves. The only downside is the ‘cracked wall’ effect is created by a wall sticker which some might not like the idea of. We love this LED robot nightlight that looks equally as cool during the day as it does at night. You can also get other designs such as mermaids, butterflies, unicorns and rockets to cater to both boys and girls. The best thing about this lamp is that it has a timer function that will slowly dim the light over time and then switch off after one hour which is perfect for children who don’t like to go to sleep in the dark. This kid’s lamp also has 12-colour cycle or can be left on white for more neutral light. If you have more than one, the remote will control both lamps which can be a bit of a pain. If it’s time to start training your little one to sleep in their own bed, then the Itian Multi-Function Mini Pig is a cute little bedside lamp that will help them drift off with ease. This kids lamp acts as a projector, speaker and nightlight all in one so you can play music and soothing images to induce sweet dreams every night. It also has a dimmer which is a great way to wean your children off of sleeping with the light on. Whether it’s a weekend with the grandparents or a camping trip with friends in the back garden, this multicolour LED mushroom lamp is the ideal nightlight for taking on trips. It has a rechargeable battery that lasts for up to 7 hours (although it dims over time); perfect for a good night’s sleep. It is charged via USB cable so it is easy to plug into a power bank when not near a plug socket and is lightweight for easy transportation. Lightstax is every kids dream and is a fun and exciting way to light up the room. This product consists of light up blocks, so your child can build their very own lamp. We think this is a great concept, especially for kids who get bored easily and change their minds every week about their favourite things. It’s the deal way to keep kids busy before bedtime and allow them to display their own piece of artwork in lights. Many users who have kids with autism and other learning difficulties say this product has been a fantastic way to encourage creative flow. For all the Star Wars lovers out there, may the force be with you when you buy this multi-coloured lamp. Although smaller than other lamps, this is a great novelty nightlight that is perfect for desks, bedside tables and taking to sleepovers. You can also get many other characters including Kylo Ren, Chewbacca, Death Star and many more for those who collect Star Wars merchandise. From the inventor of the Lava Lamp, we bring you a quirky projection lamp that will take you on a journey through time and space. Your kids may think it’s out of this world, but so is the price tag! Although expensive, if you have a big family with lots of children, it’s a cool item to be able to hand down through the generations for other to enjoy. We’re sure all the big kids out there would love this item too, making it a solid feature for a man cave or gaming room. If you don’t want to spend a fortune on a novelty kids lamp that they will inevitably grow out of, then this dimmable bedside lamp provides a relaxing atmosphere anywhere in the house. It is great for reading as it has a dimmable function so you can control the brightness as well as touch activation for easy use. Grandparents may find this a suitable option for when the kids come to stay as it can be used as a regular lamp in the spare bedroom as well as a handy nightlight.